The new Macan stays true to the Porsche design DNA with a three-dimensional LED tail light strip. LED technology also features in the headlights as standard. The most striking innovations inside the vehicle include the 10.9-inch touchscreen of the new Porsche Communication Management (PCM), re-designed and re-positioned air vents and the GT sports steering wheel familiar from the 911. The PCM enables access to new digital functions, such as intelligent voice control and the online navigation system provided as standard. The vehicle’s range of comfort equipment has also been expanded to include a traffic jam assist, an ioniser and a heatable windscreen. Thanks to a number of conscious changes to the exterior, the new Macan now has an even sportier and more modern look. Numerous details reflect the DNA of the iconic 911 sports car and the 918 Spyder. In particular, the topic of lighting plays a key role: The new Macan is equipped with headlights featuring LED technology as standard. This high-quality lighting system featuring modules with a three-dimensional design can be further optimised if desired: The Porsche Dynamic Light System Plus (PDLS) can be used to adaptively control the light distribution. The front end of the Macan has been meticulously re-worked so that it now appears even wider, while the comprehensive overhaul at the rear builds on the sleek design of the predecessor model. The three-part, three-dimensional LED light strip represents another typical Porsche design element at the rear. The four-point design of the brake lights also reflects the brand’s identity. The link to the 911 is consolidated in the interior of the new Macan with the optional GT sports steering wheel. The mode switch plus Sport Response Button integrated into the steering wheel is also showcased in the Macan as part of the optional Sports Chrono Package. Porsche has extended the list of comfort options to include a heated windscreen and an ioniser to improve the air quality in the interior. New exterior colours such as “Miami Blue”, “Mamba Green Metallic” “Dolomite Silver Metallic” and “Crayon” combined with new interior packages ensure that the Macan is now more customisable than ever before. Through the new Porsche Communication Management (PCM), the Macan offers total connectivity and numerous digital functions. Above the typical Porsche rising centre console, a full-HD touchscreen enlarged from 7.2 to 10.9 inches has been incorporated seamlessly into the newly designed instrument panel. Just like in the Panamera and Cayenne, the user interface on the infotainment system can be customised using predefined tiles. The air vents have also been re-designed and are now positioned below the central screen. 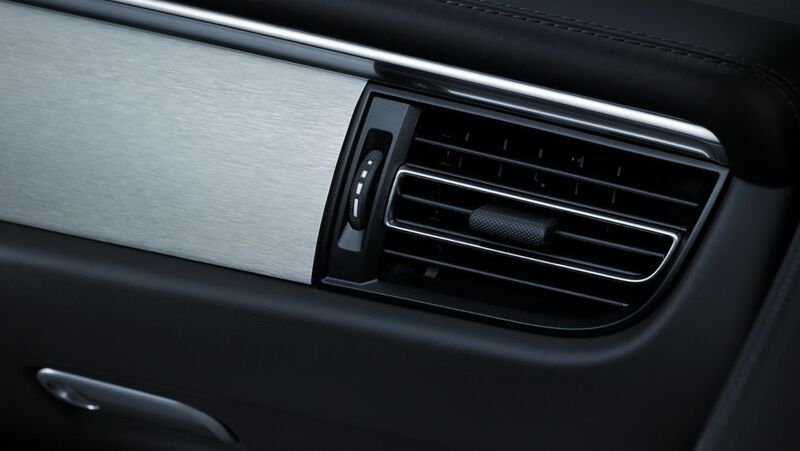 Each Macan is equipped with a Connect Plus module, making every vehicle fully networked as standard. This module underpins various digital functions and services such as intelligent voice control and the real-time traffic information that forms part of the standard online navigation system. One of the key elements of this system is the “Here Cloud” connection, which offers cutting-edge, swarm-based traffic data. Using the new Offroad Precision App, it is also possible to record and analyse off-road driving experiences in the Macan. Having been extensively revised, the Macan will shortly be entering the second half of its model life cycle. The Porsche Advanced Cockpit in the Cayenne is fully integrated into the sporty, luxurious atmosphere. Porsche is investing in the further expansion of the Leipzig site as the Macan will be produced in Leipzig.